Today marks the first official day of summer! Now that we finally get to wear our flip-flops and swim suits, let’s plan to make the most of our summer fun. TicketsatWork has incredible summertime savings to get your sun-filled adventures underway. Here’s how to celebrate the new season! Nothing beats a good, old-fashioned summer road trip. From the mountains to the beaches, the big cities to the small towns, packing up the car and heading out into the great wide open for a new adventure is a bona fide summertime tradition. No matter if you are on a road trip, or flying off on a family getaway and need transportation at your destination, Tickets at Work has super savings up to 25% nationwide for four different car rental services. Type in your pick-up location, select the desired dates and check all the options and excellent discounts from Hertz, Dollar, Enterprise, and National. The theme parks are certainly going to be jumping with activity during summer. What better time to check out all the new rides, and all your longtime favorites? 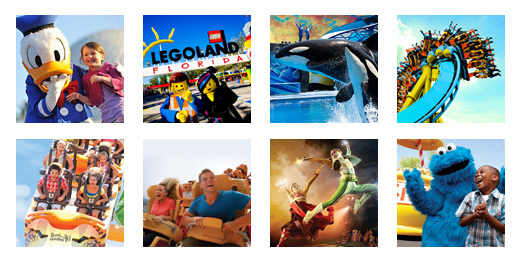 TicketsatWork.com is your top spot for ticket discounts to all the best theme parks across the U.S. Experience awe-inspiring shows, one-of-a-kind attractions and up-close animal interactions. New rides include Kraken Unleashed. This re-imagined coaster features new VR technology designed to put you in a dazzling digital reality landscape. Take your vacation to the next level at Universal Orlando Resort™, which is filled with three amazing theme parks – Universal Studios Florida™, Universal’s Islands of Adventure™ and Universal’s Volcano Bay™ water theme park. How about a trek out west to sunny California? Enjoy a fun-filled day at Disneyland® California. Be sure to check out Pixar Fest, the biggest Pixar celebration ever to come to Disney Parks, brings guests together to celebrate friendship and beyond for a limited time, now through Sept. 3, 2018. A fantastic family theme park located in Derry Township, Pennsylvania, Hersheypark® is a wonderful place for summer fun with the whole family. The 110-acre, clean and green theme park features more than 65 rides and attractions. It features 11 thrilling roller coasters and 20 rides designed just for the kids, plus live daily entertainment, and plenty of games-food-shops, and much more. Let’s pause for a moment to talk about how nice it is to enjoy a scoop or two of your favorite ice cream on a hot, summer day. So in between all the summertime fun, make sure to slow down and have some ice cream with family and friends. It’s summertime, so being outdoors to enjoy the sun and Mother Nature should be at the top of the to-do list. For our friends looking to add some outdoor adventure to their summertime itinerary, TicketsatWork has a wealth of exciting sightseeing tours for city exploration and many terrific physical activities to liven up your summer days. If you’re looking to get to know the big town in Texas a little better, try the Dallas CityPASS® and discover Dallas’ best attractions for one great price. Save up to 45% on the pass, covers admission to the city’s four top attractions, including the Dallas Arboretum & Botanical Garden and the Dallas Zoo. If you’re visiting Boston, why not beat the heat with Sourced Adventures and enjoy a Boston River Tubing & Brewery day trip. Save 20% and experience hit a fun, 3-hour river float with friends. While in Boston, why not hop aboard for a sightseeing trip around the historic town via the Boston Old Town Trolley Tour. Featuring 20 stops, the tour allows you to explore at your own pace as you hop on and off the trolley. Highlights of the tour include New England Aquarium/Faneuil Hall Marketplace, Beacon Hill/Boston Common, Fenway Park, and so many more. Save up to 20%! Let’s head south to Miami, FL, where you can cruise through glamorous South Beach on the Miami Art Deco Segway Tour or embark on a bike ride on beautiful Key Biscayne Island, a natural oasis with perfect bikeways and pristine beaches. Add some pizazz to those lazy days of summer with a special getaway to experience a cool tour, fun theme park or sight-seeing adventure. Happy summer!